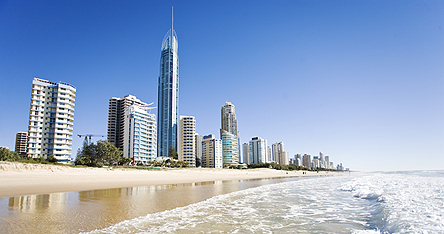 Whilst it may be winter down under, Brisbane is always fun, which makes it the perfect summer holiday destination. With a sunny climate and fairly steady temperatures it is not hard to see why people love this city so much. If you are visiting in September you will also experience the sights and sounds of the Brisbane Festival, an internationally renowned show of art and culture. South Bank is one of the most popular parts of this beautiful city; it combines the very finest of Queensland’s natural beauty with the best that Australian culture has to offer. From the Parklands to the man-made Streets Beach, South Bank is where both locals and tourists alike come to soak up the sun, go for a swim in the river and chill out in the local cafes and bars. It is also the cultural hub of the city, playing host to the city’s main museums and theatres, in which shows and art exhibitions of international renown are held. At the weekends the streets come to life with lots of little market stalls lining the boulevards, an ideal place to pick up something unusual. For something a little more adventurous, try taking a stroll to Kangaroo Point. The city’s first suburb now hosts a whole range of fun and activities, whether it’s exploring the river with the Riverlife Adventure Centre – who offer adventures all year round, relaxing in the parks, scaling the towering Story Bridge, to just admiring the city from the towering cliffs, there is something to keep everyone happy here. Whilst in this part of the city a must-see is the Brisbane Jazz Club, which attracts some of the biggest names in jazz from across the country and the world, a great way to spend an evening. With activities ranging from horse racing to museums and even the Lone Pine Koala Sanctuary (who doesn’t want to hug a koala? ), Brisbane has it all going on during the day, but the fun does not stop when the sun goes down. During the evenings the city comes alive with restaurants, cafes, bars, pubs and clubs, offering everything from local food to a great night out. Brisbane City (the central district) plays host to many of the top restaurants and nightlife, with a plethora of restaurants alongside bars and clubs. The Eagle Street Pier is a favourite spot combining everything from Sunday morning markets to boardwalk bars at night - a food lover's paradise. Brisbane is slightly cooler from June to September than at other times of the year as it is winter. Temperatures at this time of year are usually around a pleasant 20 – 25°C.